The faces of the friends you were meant to have, but were born too late to meet, gaze warmly at you from old photographs. Outside, there’s nothing but grey skies and traffic. On the South Bank of the Thames stands a memorial to the British volunteers who went to fight for the Republic in the Spanish Civil War. There are names there from every part of the country, every part of society, from coalminers to nephews of Virginia Woolf. I remember standing there in 2003, scanning the list, trying to imagine the life behind each name. All of them still stand, something makes you believe, alongside Orwell and Hemingway, in the brilliant sunshine that still blazes out at us like noontide from the photographs of the Civil War, photographs that were printed on posters and in magazines that seem far more modern, somehow, in their uncluttered directness and sure purpose, than anything new today. The yellowness of the paper – the way the dust has burned its way into the hinges, the rust on the long 1930s stapes – all this can shock: some things are so obviously young that the marks of ageing become sacrilegious. They found another huge batch of Spanish Civil War photographs recently: in what’s become called the Mexican Suitcase. 4,000 odd negatives – long rumoured before their reappearance – from the cameras of Robert Capa, “Chim” (David Seymour) and Capa’s lover and collaborator Gerda Taro. They’d disappeared from Capa’s studio in Paris in 1939, and also contained rolls of Fred Stein’s images of Capa and Taro themselves, images which are fast becoming iconic in themselves. They are not hard to fall in love with, as you’ll see. These are famous names now, and famous images, but it’s an intimate kind of fame, born in the claustrophobia of war and friendships begun then in youth that for some would last lifetimes and the changing of entire world orders. “Gerda Taro”, like “Robert Capa”, was an assumed name. Gerta Pohorylle was actually a Polish Jew, who washed up in Paris having been driven out of Germany for distributing anti-Nazi literature. 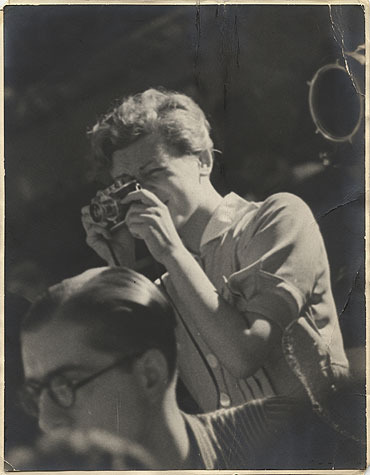 She met Capa there in 1935, became his assistant, and learned photography: between the two of them, they covered the coming to power in France of the Popular Front and then, when the Spanish Civil War broke out in 1936, moved to Barcelona. There, she’d find her own way: got to know Orwell and Hemingway and the young Willy Brandt, made her name with her images of the bombing of Valencia, started her own Photo Taro label, work for Ce Soir, Life, The Illustrated London News. Capa would go on, of course, and we have his great ruined photographs of D-Day, but Taro would never leave Spain: in mysterious circumstances, in July 1937, she fell beneath the tracks of a tank whilst covering the Republican retreat at Brunete, and died of her injuries a day later. The French Communist Party gave her a magnificent funeral, and buried her in Pere Lachaise under a tomb by Giacometti. There is a Pinterest board to accompany this post here. This is an amazing post and the photos are so haunting. What happened to the world in the 30’s? So much naive and Inocent ideology. These wonderful people thought they could stop fascism and nazism. They all look so optimistic. Gerda is so beautiful and alive. Thank you for sharing, I hope, what I wrote wasn’t all waffle? Your post really moved me and that’s the best I can manage. Well done Sir! “in mysterious circumstances, in July 1937, she fell beneath the tracks of a tank”: oh dear, anyone who’s read Orwell might be prepared to take a guess at what happened. Which in one way is foolish, and in another inevitable. It’s people who abhor a vacuum. Horrid sentence too: I should have rewritten it. You’re right, of course, and there appear to be at least 3 different versions of what happened. The one I favour sees her going under one of the Generalissimo’s tanks. Standing on the running board of a truck, she fell off, and… (2) She falls off the running board, and goes under one of the REPUBLIC’S tanks or, (3) the Orwell version if you like, which the Staggers put forward, that she was pushed by one of Stalin’s agents. The chaps running the Republic must have been pretty thick. Apparently they paid Stalin for their tanks, thereby reducing his incentive to ensure they won. By contrast many Americans believe that Wilson launched the USA into The Great War in hopes of ensuring that France and Britain survived and might therefore repay their debts. and attempts to fill the information void in the city about the siege of Madrid and the Spanish Civil War. We organise four tours which try to tell the story through the eyes of four foreigners who in participated in the conflict – each being involved in a major battle. I hope that it will be of interest.